Unless you reject the idea of horse racing, you have to accept that horses break down and are destroyed. It's an unfortunate part of the sport, and lots could be done to minimize fatalities, but it's always going to happen. At Churchill Downs yesterday, five-year-old mare Never Tell Lynda did not need to die. Never Tell Lynda was not racing, but was getting a walk-through of the track. She was walking back toward the paddock when something startled her—she reared up, fell backward, and struck her head on the ground. "I could see it in her eyes," said her trainer, Kenny Wirth. "Blood started gushing from her nose and mouth." She was quickly put down by a track vet. "It was quickly evident that this horse was in the process of expiring," said Kentucky Horse Racing Commission chief veterinarian Will Farmer, who speculated that Never Tell Lynda may have crushed bones in the back of her skull. "To ease her suffering, one of our veterinarians euthanized her." 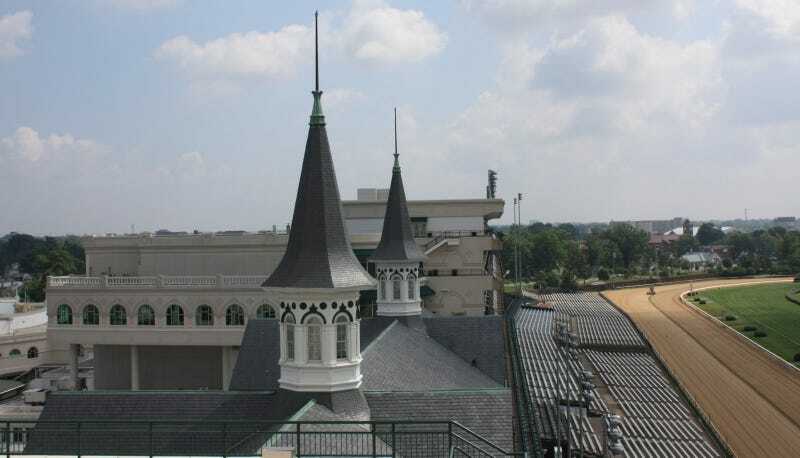 Her trainer knows what startled her—the sound of a starting bell and a starting gate slamming open in a commercial on Churchill Downs' new, massive video board. "We teach horses to break from that," Wirth said. "And you've got it on a loud speaker that everybody in a two-city block can hear. Well, what's she going to do? She thinks she's supposed to take off. And that's what she did. And when she did, she lunged and she lost her balance and went down." The new video board premiered last month at the spring meet's opener, and cost $12 million to install. The project included 750 new speakers installed around the track. On Derby weekend, jockeys Gary Stevens and Rosie Napravnik complained about the "overwhelming" volume of the speakers, blaming them for skittish horses in the gate. The commission's chief steward acknowledged yesterday that they has received multiple complaints about the sound system being too loud. There are plans to take action now—most obviously, perhaps not blaring the sound of a starting bell. Too late for Never Tell Lynda. "We can't bring her back," said another trainer, Dale Romans. "All we can do, in her sacrifice, is to make sure that it never happens again."